Providing your pet with a larger cage is one of the most important steps that you can take to ensure its good health and longevity. My observations of parrots, both in the wild and under my care in zoos, have convinced me of this. Appropriately-sized cages allow our birds to engage in a greater variety of behaviors and, by reducing stress, help to limit health-care expenses. Training is often simplified, as parrots kept in tight quarters are difficult to interact-with. 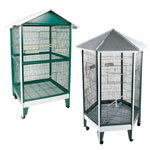 A & E Victorian Style and Dometop Cages and Prevue Select Parrot Homes are wonderful options for parakeets, lovebirds, cockatiels, conures and other small parrots. They provide plenty of space in which to add vine and rope perches http://www.thatpetplace.com/pet/cat/infoL3/23985/category.web, which will increase the usable area. The Victorian Cage’s roof-top door allows your pet access to an open-air perch site. 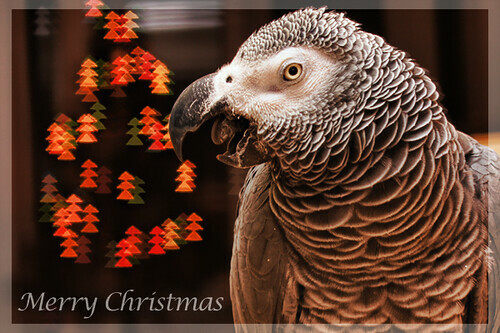 The needs of African Grays, Amazons, smaller cockatoos and other active, similarly-sized species are rarely met by typical parrot cages. A&E’s huge Playtop Cages, often labelled “parrot mansions”, can accommodate a pair of moderately-sized parrots. 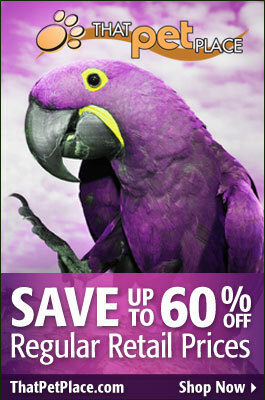 You can check-out other great homes for medium-sized parrots here. Macaws, Sulfur-Crested Cockatoos, Eclectus, and other large parrots are among the most desirable yet challenging of all companion birds. You simply cannot crowd these majestic creatures. 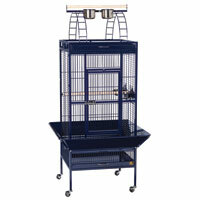 The A&E Double Macaw Cage is one of the largest indoor parrot homes available. 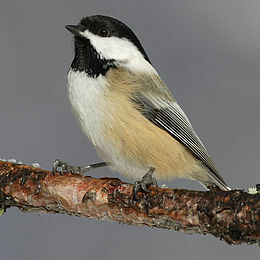 Other similarly-sized cages, some designed to fit specific avian needs (i.e. height) or locations within your home, are on display here. Whether you keep a single Rose-Breasted Cockatoo, a pair of Amazons, or a flock of parakeets, outdoor aviaries make perfect warm weather homes or exercise areas. Available in five sizes ranging 3.5 x 4 feet to 9 x 5 feet, an aviary could well-be the ultimate gift for just about any bird or bird-enthusiast. 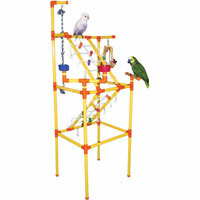 From Java-wood climbing posts to wheeled, wrought-iron units suitable for the largest macaws and cockatoos, playstands can be used to create important out-of-cage exercise opportunities. Parakeets, cockatiels, love birds and other smaller parrots will appreciate durable plastic “mini-gyms”. Playstands can also be used to lure reluctant parrots from their cages so that they can become accustomed to people, and make useful platforms on which to conduct training sessions. Most of us “expand” our diets during the holidays, so perhaps we should do the same (within reason!) for our pets. If you like the idea of doing more food preparation than just pouring food into a bowl, consider Birdy Banquet’s Cooked Diet, which features vegetables, pasta and other nutritious treats. Goldenfeast Tropical Fruit Pudding is a delicious treat as well as a highly-nutritious food. Packed with preservative-free papaya, mango, figs, dates, prunes, cherries, cranberries and other fruits that are often missing from standard diets, it is hard to resist. Sugar gliders, rats, degus and other small mammal pets will also gobble it up. If your shopping list includes more stocking stuffers than outdoor aviaries, these unique macaw, cockatoo, parrot, and hummingbird-themed gifts will please anyone who keeps or appreciates birds. Previous: The Best Way to Prevent Feather-Plucking – Make Your Parrot Work!